Heart surgery is a procedure that often leaves scars on the chest, sternum, back, abdomen. or other places in which an incision is made. Healing from these scars does not mean that the scars will disappear. However, they will become less pronounced over time, and there are secondary procedures which can be performed following the surgery to reduce or remove these scars. Furthermore, while some incisions are bound to leave major scars, there are a number of incisions that minimize scaring during heart surgery. What Scaring Will There Be? The type of scars that will develop after heart surgery depends upon a number of factors. Most important among these is the type of heart surgery being performed. Open-Heart Surgery is highly invasive and typically requires large incisions be made within the chest and sternum. Heart transplants, valve repairs or replacements, and a number of other procedures are often performed using open heart surgery. There are other forms surgery, which are similarly invasive but do not require cutting open the chest. One such surgery includes the repair of an aneurysm. An aneurysm occurs whenever there is a bulging blood vessel within the body. Thus, this type of “heart surgery” may occur in areas of the body far away from the heart. At the same time, some aneurysm repairs may be minimally invasive. Can Scaring Heal After Surgery? After surgery, scarring occurs naturally as the body heals. Physicians may prescribe medications to help aid in the healing process including creams and pills. Sometimes, over-the-counter drugs can be used in lieu of prescription strength alternatives. Typically, it is up to the doctor’s discretion to determine what sorts of medication is needed. As the wounds heal, scars will remain. The more invasive the surgery, the worse the scar. Open-heart surgery, for example, will leave a large jagged scar along the area the incision was made. 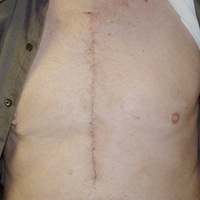 While the length of the scar can differ, open-heart surgery typically leaves a long, vertical scar across the chest, which can stretch down to the abdomen. As well, horizontal incisions may also create a “bulls-eye” looking scar. Often these treatments are used in conjunction with each other at various stage of the healing process. Discussing what procedures are necessary with a physician is important. He or she can help to design a treatment plan which specifies what treatments should be used and when. Minimally invasive heart surgery will minimize the amount of scaring. Many types of heart surgery require only small incisions into the body. Minimally invasive heart valve repairs or replacements, for example, might not require the entire chest be split open. On the contrary, a small incision may be made near the breastbone, minimizing the size and severity of the future scar. Other forms of minimally invasive heart procedures discussed in this article will also minimize scaring compared to open-heart surgery.